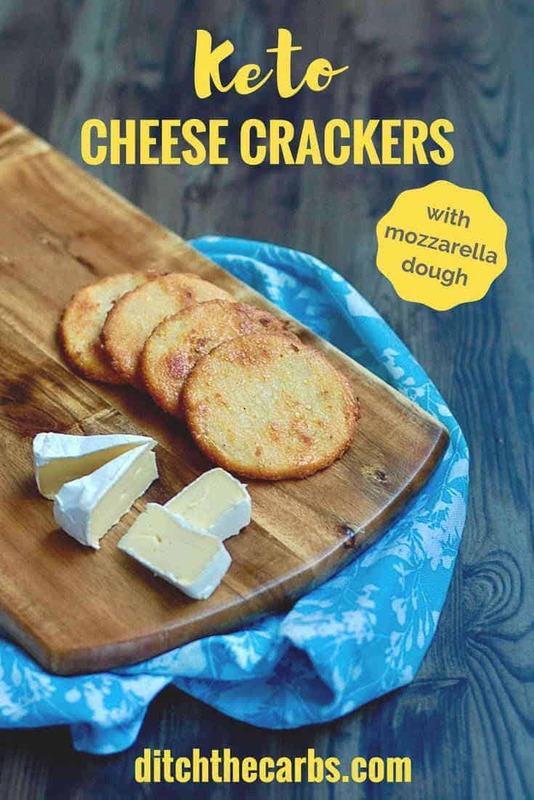 Now HERE’s a snack we can all definitely get behind – Keto Cheese Crackers! 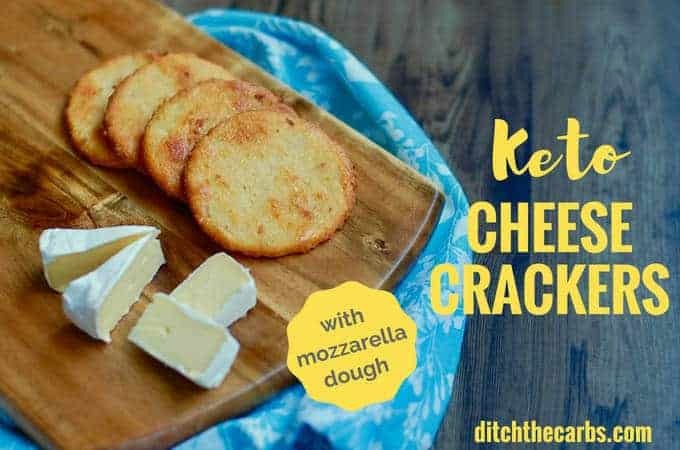 Check out this easy keto recipe for cheese crackers. You can now make that much-missed cheesy crunch – but healthier! And each cracker is only 1g net carbs!!! When you think of snacks, crisps and crackers come to mind. On a low-carb way of eating, especially if it’s your first go at it, the task of finding a good substitute in stores can be a bit daunting. Luckily for us, Fat Head dough exists and is here to stay! This dough is insanely adaptable and creates particularly cheesy dishes. Everybody loves to snack on something crunchy while enjoying a book, watching a movie and catching up with friends. And although a serving of 100 grams of your regular crackers would amount to about 61g net carbs, we knew it was something that would be missed. But with mozzarella dough a.k.a. 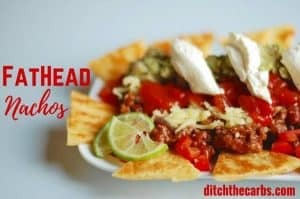 Fat Head dough, it’s possible to make low-carb crackers! 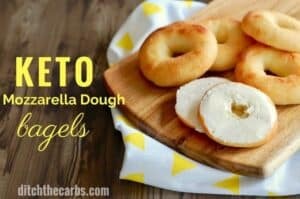 Since the dough is made of mozzarella, cream cheese, egg and almond or coconut flour, you’ll be sure that it has no grain or wheat. Hooray for Fat Head dough! Have these Keto Cheese Crackers Anywhere and Anytime! With this, you can have crackers for you and your family in no time! Serve them in a bowl when friends are over or pack some for your children’s snack packs. You can even pair them up with a favourite low-carb dip! Have a crack at this cracker recipe! INSANE keto cheese crackers with mozzarella dough. 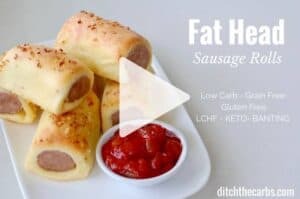 Healthy and easy gluten free recipe. Add the egg then mix gently to make a cheesy mozzarella dough. Place the mozzarella dough between 2 pieces of baking parchment/paper and roll out (see photos here). Remove the top baking paper/parchment. 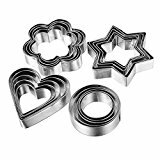 Use a cookie cutter or a glass tumbler, and cut circle cracker shapes. Place each cracker on a lined baking tray/sheet pan. Bake at 220C/425F for 5 minutes on one side, then turn each one over, and cook for a further 5 minutes, or until golden brown. Keep a close eye on the keto crackers, they can burn easily. Optional: Mix 2 tbsp melted butter, 1 tsp parsley and 1 tsp garlic. 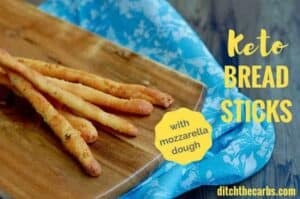 Brush over the top of the keto cheese crackers. I’m doing Weight Watchers and I need the Saturated Fat to figure out my points, would you have that information. I’m making the Keto Cheese crackers. Thank you!! We don’t count saturated fat here so I don’t add it into the panels. The fear of saturated fat is so old fashioned and outdated. Research shows saturated fat is healthy, stable and protective. This is a good article to read. Michelle, I second Libby’s remarks about “The fear of saturated fat is so old fashioned and outdated. Research shows saturated fat is healthy, stable and protective.”. In addition to her link, get a used copy (or new) of Nora Gedgaudas’s book Primal Body Primal Mind. 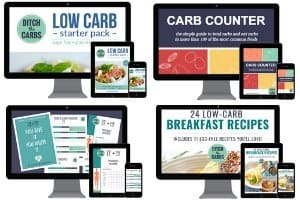 Dr. Eric Berg has put out many youtube videos about Keto and intermittent fasting. Search his name with weight, or keto, or intermittent fasting, or phytic acid. They are some interesting videos. How long might these last if stored in tuppaware please? Was hoping to make a batch on a weekend to have throughout the week for lunches. Thanks! I would store them in an airtight container for up to 3 days in the fridge. Is it possible to make / melt without a microwave? Yes, you can melt them gently on the stove top in a saucepan. My dough is sticking to the parchment paper. What am I doing wrong? Mine did too…scraped as much as I could off, but wasted heaps, so I added more flour…managed to cut them out then, but they stuck so badly to the oiled alfoil I couldn’t prize them off!!! Mine were a disaster!!! U mean one cracker is 81kcal or 15 crackers? Thanks! This is per cracker (luckily we don’t count calories here 😉 ). Would this be ok being rolled into a log and sliced thin? Just wondered. What a brilliant idea! Yes, I think that would work.